“Ande­thanna”, the for­mer name of Nieder­an­ven is, accord­ing to the hand­writ­ten doc­u­ments, the old­est name of a vil­lage of the Grand duchy of Lux­em­bourg and already appeared on a road map dat­ing the roman time. Numer­ous items found, show clear­ly that this place was already pop­u­lat­ed in the stone age. Sit­u­at­ed on the bor­ders of the city of Lux­em­bourg, the munic­i­pal­i­ty of Nieder­an­ven evolved towards a mod­ern hous­ing and work­ing place. Today the munic­i­pal­i­ty includes the local­i­ties of Nieder­an­ven, Ober­an­ven, Sen­nin­gen, Sen­ninger­berg, Hostert, Ramel­dan­ge, Ern­ster, Wald­haff and Staffel­ter. 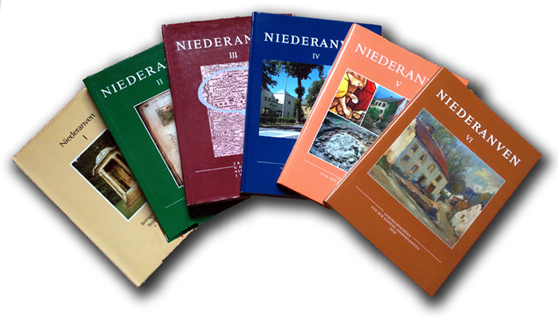 6 books on the his­to­ry of the munic­i­pal­i­ty of Nieder­an­ven have been pub­lished until now. You can buy these books at the Town hall.